Construction has finally begun on the new $8 billion Green Square Town Centre, with a massive ground-breaking ceremony for the centre’s first residential building, Ebsworth. The sought-after Ebsworth building was sold out in a record two days when released to the market, and is set to feature 174 apartments spaced over 10 storeys of world-class amenities. UrbanGrowth NSW Chief Executive, David Pitchford, believes that this milestone marks a significant time for both Green Square and the surrounding region. “The start of the construction marks the start of the Green Square Town Centre, and shows UrbanGrowth NSW’s commitment and capability to drive urban transformation that will increase the supply of housing and jobs, and transform city living by designing world class centres that are vibrant, connected, and a great place to live and work,” Mr Pitchford said. “It is particularly significant for UrbanGrowth NSW as it is the first of our major urban transformation projects to start the building phase. Mirvac’s Chief Executive Officer and Managing Director Susan Lloyd-Hurwitz also expressed how proud she was to see the project commence construction. “Ebsworth represents the first stage of apartments to be delivered by Mirvac and UrbanGrowth NSW in the heart of the new Green Square Town Centre, and it’s exciting to take another significant step towards our first residents living at Green Square in 2016,” Ms Lloyd-Hurwitz said. 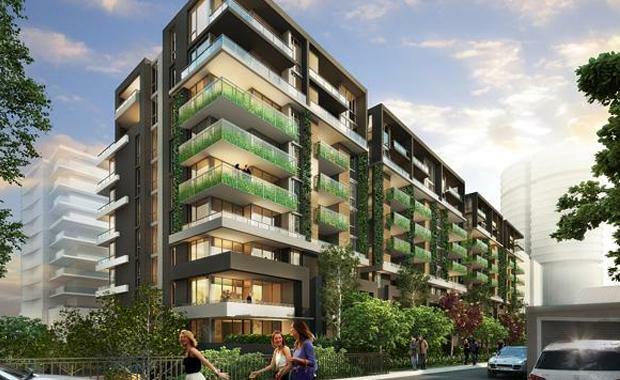 “Ebsworth’s popularity with buyers reflects the strength of the Green Square offering as well as the superior design of the apartments and price points. 20 per cent of Ebsworth’s broad mix of layouts and sizes are adaptable and cater to occupant needs through different life stages. In addition, residents and the local community will benefit from a broad array of high quality retailers that will create a lively high street shopping environment,” Ms. Lloyd-Hurwitz concluded. Ms Lloyd-Hurwitz said the Green Square town centre would redefine the meaning of a neighbourhood. “It’s going to be a vibrant and active space where people will live, work, shop, dine and enjoy a whole range of cultural activities,” Ms Lloyd-Hurwitz told News Limited. “To us Green Square is the perfect combination of location. It’s 3.5km to the city, 4km to the airport, Green Square train station is right there with amenity and the right environment so the actual apartment product is going to be pretty special and very sustainable in terms of how we’re building it,” she said. Next to be released to eager buyers in the Green Square Town Centre will be a 28-storey apartment building only steps away from where Ebsworth will stand.